Most email analytics are, to put it mildly, not very good. The guidance given to us by numbers like open rate or click-through rate often encourage a kind of passivity: too many of us watch our numbers like they are the weather – just something that happens to us. Or, if we are acting in response to our analytics, we are going on very slender evidence that we know why a particular day’s numbers were good or bad. In 2017, along with a team at WBUR, I launched The Magic Pill, an audio newsletter that won the Edward R. Murrow Award for Excellence in Innovation. We chose email over other delivery platforms because we knew that email would give us much more data about who our listeners were and what they liked than iTunes did. Still, at the time, I would have loved to have known more about subscriber behavior than I was getting at the time from Mailchimp. That’s why I was excited to read The Shorenstein Center’s paper Using Data Science Tools for Email Audience Analysis: A Research Guide, by Jacque Boltik and Nicco Mele. I was even more excited to see that they had provided a set of tools so that we could do the analysis they talked about in their paper with our own data. On Thursday, March 8, I gave a presentation to Seattle’s ONA Local chapter on applying data science tools to build better email products. We didn’t have the time to do a hands-on runthrough of this particular tool, so this tutorial is both for attendees of that event who want to go further, and for those unable to attend but are interested in the intersection of data science and email. My full presentation, and linked resources, can be found here: Lisa Williams: Data Science & Email. This post is intended to be a guide to setting up and using those tools. It is especially aimed at the technologically curious person who works on an email product, but has little experience with data science tools or coding. Beginners welcome here! This guide is written from my POV as a Mac user, but many of the basic tools will work on Windows, and of course on Linux. I regret that I can’t give line-by-line instructions for those platforms, however. Terminal We will be using the command line for this tutorial. 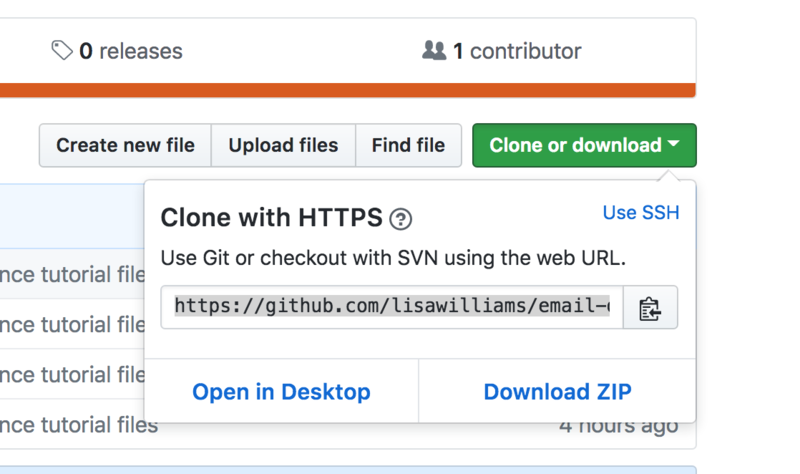 Git and Github The files we use to do our data science experiments are located on Github.com, a code sharing and collaboration site, and we will use the version control system, Git, to get them down onto your computer. Anaconda The Shorenstein Notebooks use Python, so we will download a distribution of Python. Jupyter Notebooks These can read the Shorenstein notebook files. It comes with Anaconda. You will also need a modern web browser. I am using Chrome Version 65.0.3325.146 as I carry out the steps of this tutorial. If you don’t know if you have Anaconda installed, open up Terminal. You will find Terminal in the utilities folder. Type conda --version. If Anaconda is installed, it will give you a response like conda 4.3.30. Check on the Anaconda website to see if you have the latest version. If you get no response, you’ll need to download Anaconda and install it. If you do not have one already, you will need a free Github.com account. Github is an online code-storage and collaboration service. Git is a ‘version control system.’ Often, when I am coding, I try something, and I break things. Having a version control system means I can ‘roll back’ my code to a previous state…one where it was working. Git and Github work together. Git is the part that resides locally on your laptop; Github is the online service where you store an extra copy of your code or collaborate on code with others. First, check to see if you already have Git installed. Back in Terminal, at the command line, type git --version. If it is installed, you’ll get a response like this: git version 2.11.0 (Apple Git-81). If you don’t have it, it will prompt you to install it. If you’ve never heard the phrase ‘fork and clone’ before, don’t be worried. It just means you’re going to make your own copy of the notebooks on your Github account, and then ‘clone’ those files down onto your local computer using Git. Type ls again at the command line, and you’ll notice you have a file called nb2_anon.pkl. Scroll down to explore how the notebooks slice and dice the data. Be sure to open both notebooks – they show very different views of the same subscriber data! For a full explanation of what you’re seeing, read the accompanying paper from Shorenstein for a full explanation. At your notebook home screen – the one with the list of files – you’ll see a tab called ‘Running’. Click this. Shut down any running kernels or they will run in the background and take up your CPU. Then, visit the command line and shut down the Jupyter Notebook application by typing Ctrl-C.
Special thanks to Jacque Boltik of the Shorenstein Center and devens.io, who provided invaluable help in creating sample data files and hooking them up to the notebooks for this tutorial. Special thanks are also due to Sarah Darby, Anika Anand, and Michelle Baruchman for making the email data science workshop in Seattle happen, as well as Meghan Murphy of ONA and the ONA Speakers’ Bureau.